Was it, as the Chinese say, People Mountain People Sea? Yes, of course, as you would expect of a locale listed alongside The Great Wall, The Bund and The Terracotta Warriors. But, you know what? It turned out okay in the end! In fact, more than okay - I had a lot of fun and would recommend a trip here to everyone. There were several things that I personally would’ve tried to optimize should I do it again, mostly because there is precious little info online in English for non-Chinese potential visitors to do their planning with. There are several attractions of note in Zhangjiajie (including what is, I’m sure, a beautiful little water town), but I’m going to concentrate on the mountains - those gorgeous rock formations that I believe most people come here for. Tianmen Shan, a mountain that’s right next to Zhangjiajie city. The actual Zhangjiajie Nature Reserve in Wulingyuan, home of the “Avatar Mountains,” and surrounded by a town dedicated to nature reserve tourism about an hour away from the airport. Route C: No cable car, just buses. Alternatively, certain tour groups can get you cable cars up and down, but I recommend Route A. It is much easier to get a taxi to the foot of the mountain (where the busses are), especially in the morning. The cablecar starts in the middle of the city, which makes it a landing place with much more variety in food choices & last leg transportation. Ideally, it would’ve been better to get a ticket for the morning - which would’ve only been possible if we had arranged that with our tour group/hostel or going to one of the ticket booths in the city the day before. By the time we reached the Front Gate, at around 8:30am, all the A tickets had sold out, the only B tickets were for 4pm, and the only C tickets were for 2pm. The 99 Bends: which the bus up drives through and is quite tipsy turvy but wow what a view out the windows as you climb higher and higher. I don’t think you get a true feeling for it just looking down from the cable car. The Stairway to Heaven: which takes you to the “highest hole in the world” (lol). We took the escalator up to save some time - it was… 20 minutes on several escalators, with only posters advertising tourism in places like Tianjin!!! If we had come in the morning, I would have attempted to climb the 999 steps. The Glass Skywalk: which closes at 4:30pm, rendering all 4pm+ tickets crap. There are actually several glass skywalks and they all offer the same feel, so don’t feel the need to do more than one of them. Cliff Hanging Walkway: Just a walkway on the side of the cliff. But it was a lovely walk with stunning views, and there were almost no people on it. Because we were part of the last groups to leave, we were allowed to take the cable car down. However, because we were part of the last groups to leave, waiting in line to get on that cable car took something like 2 hours. I finished a book in that line. Yeah, this was no fun. Tickets cost 258rmb. Book them beforehand if at all possible. Go before 2pm. Any time frame after that is a waste. Bring cash. Anything that isn’t you using your own two feet costs money. Not everywhere takes WeChat/Alipay (and nowhere takes credit cards). There are a bunch of snack shops, but not particularly great ones. If you’re picky about junk food and worried about getting hungry, bring your own food. There IS beer at the snack shops though, so yay! Okay, so assuming you’re like me, a person who suddenly finds that they can’t go up to Tianmen Shan until 2pm. What do you do with your morning? What’s there to explore? The Tujia were a people known for its highly disciplined fighting men and their traditional Baishou Dance, which uses 70 ritual gestures to signal everything from farming to war. They are also known for their magic and their walking dead - jiangshi, the hopping vampire, allegedly came from a Tujia sorcerer who decided the best way to transport the bodies of dead Tujia soldiers home was to get them to walk the road themselves. Learn fun facts like this and more by going to the Tujia Ethnic Folk Garden and knowing (or having someone know) enough Chinese to understand the tour guide. Also, it’s a very pretty mansion palace. 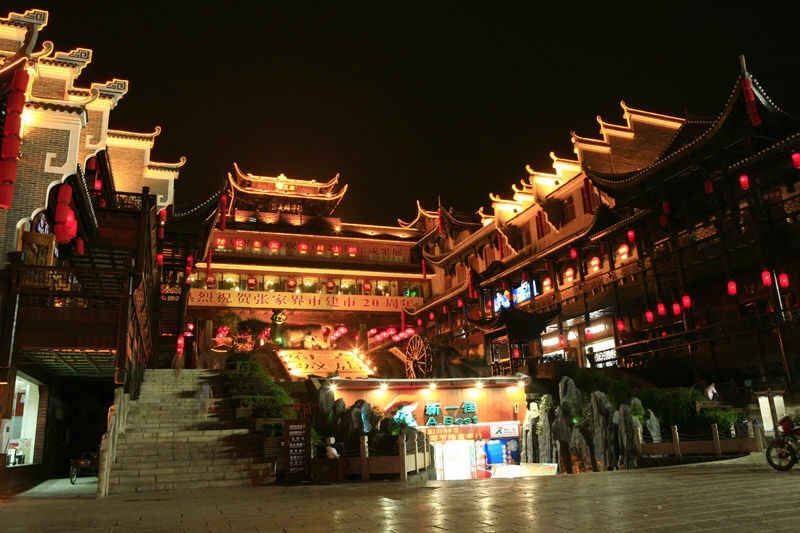 A chintzy museum/shopping area that ostensibly showcases the history of the five ethnic groups that occupy the Zhangjiajie area - Han, Bai, Miao, Yao and Yu - but really is just a chance for you to buy some souvenirs and see some funny sculptures. There are a lot of decent local eats to be had in this area, so it makes a decent place to come for lunch or dinner.